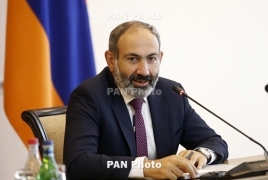 PanARMENIAN.Net - Prime Minister of Armenia Nikol Pashinyan has commented on Russian Foreign Minister Sergey Lavrov’s assessment that the situation in Armenia "continues to boil". “Yes, it's really hot today," Pashinyan joked in response to a request to comment on Lavrov's statement. Earlier, Lavrov said that Russia is worried that the situation in Armenia "continues to boil". He added however that the issue is the internal affair of Armenia. Lavrov's comments came amid a major investigation into clashes between the police and protesters 10 years ago, which left 10 people dead.